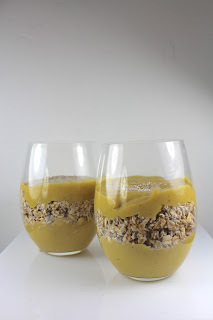 Overnight Omega 3 Oaty breakfast! I'm not sure if you are like me, but throughout the year, I usually stick to one of two breakfasts with maybe just varying the berries on top: either my homemade gluten free, sugar free, granola or my homemade GF, sugar free muesli. I think I just want to get up and not really think about creating something first thing - just reach in the cupboard, pull out my cereal and add a few sprinkles and non dairy milk and start eating. But then I see all these pretty breakfasts in cookbooks and blogs, and all these smoothies, and I get a bit envious. The taste of food begins very visually for me, so eating things that look good is important. And yes, faithful granola and muesli - you do look good - but just not as "pretty" as some other breakfasts out there! So I had the idea to try making something a bit prettier, but doing it the night before - while dinner is cooking. Then when I get up, it'll all be ready in the fridge, and I won't even have to add milk! And thus - two new breakfasts came about - that I made while dinner was cooking. Pretty Parfaits! Today is the sweet mango banana version. My Triple O breakfast! 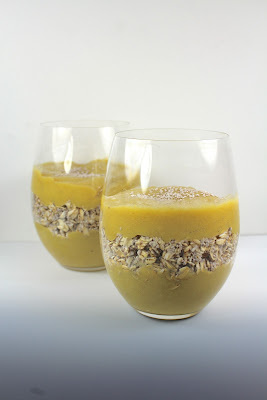 A lovely combination of oats, mangoes, bananas, flax and chia seeds and non dairy milk make up this overnight breakfast. Part smoothie, part bircher muesli - a breakfast parfait with plenty of omega 3 essential fatty acids from the flax seeds, the chia seeds and I used flax milk as the non dairy milk! Make it it in the evening, put it in the fridge and its ready for breakfast in the morning. Peel the mango and cut away the flesh from the stone, or defrost if frozen, and add to a food processor with the bananas and ground flaxseed. Blend until smooth and creamy. In a bowl, combine the oats, chia seeds and non dairy milk, stirring well. Pour half of the mango banana mix in the bottom of two glasses or bowls. Top with the oat mix, and then add the remaining mango mix as a top layer. Sprinkle with oats or chia seeds to decorate. Refrigerate overnight. Serve cold. Don't try and keep this more than overnight, as the banana in it begins to go a little brown. 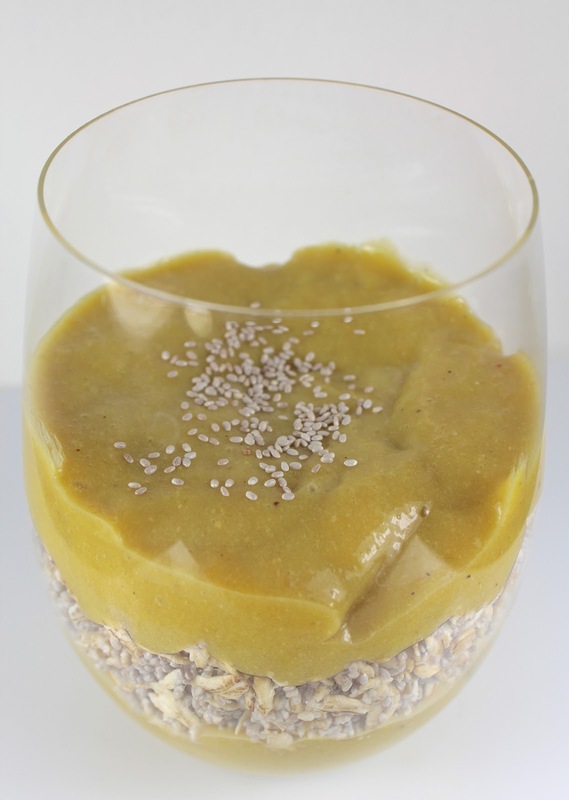 This is a wonderful way to start your day with a great dose of omega 3 fatty acids from the flax and chia. All too often our omega 6: omega 3 ratio is too low in omega 3s, so gives you a good dose in your first meal of the day. Omega 3s are anti-inflammatory with lots of benefits to your health. I used white chia seeds in this recipe as I think they look nicer, but you can use black ones instead. Nutritionally, there isn't a difference. Tomorrow's pretty parfait is a berry parfait instead. Stay tuned.